Exair Compressed Air Hose 901179-50, 1/2" MNPT X 1/2" MNPT, 50' L X 1/2" I.D. 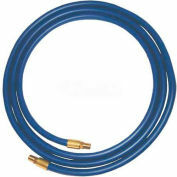 EXAIR's compressed air hose is made of reinforced synthetic rubber to assure long life and protection against ozone, weathering, temperatures up to 158°F (70°C). 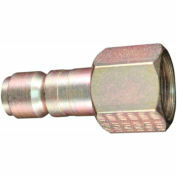 IncludesNPT male brass fitting on each end. Hose lengths are 10', 20', 30', 40', and 50'. Exair Compressed Air Hose 900061-20, 1/4" MNPT X 1/4" MNPT, 20' L X 3/8" I.D. Exair Compressed Air Hose 900061-30, 1/4" MNPT X 1/4" MNPT, 30' L X 3/8" I.D. Exair Compressed Air Hose 900061, 1/4" MNPT X 1/4" MNPT, 10' L X 3/8" I.D. Exair Compressed Air Hose 901179-30, 1/2" MNPT X 1/2" MNPT, 30' L X 1/2" I.D. Exair Compressed Air Hose 901179-40, 1/2" MNPT X 1/2" MNPT, 40' L X 1/2" I.D.